I've been working on tiny art work for the dollhouse dining room. 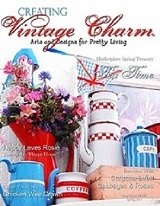 The images were from an insert in Creating Vintage Charm by Olga's Designs. She has an Etsy shop where you can buy digital art supplies. I cut out the images and glued them to matboard. I made some air dry roses and then used Spackle to make a "frame". I painted the "frame" with a soft gray and then brushed on some country white. They're still drying, but I had to show somebody!! The dining room is turning out so pretty. I found the most gorgeous adhesive fabric paper. I bought it at Michaels but you can find it here. Those are sweet and elegant and you pretty crafty to know how to do it ! Happy Easter, dear Betty !